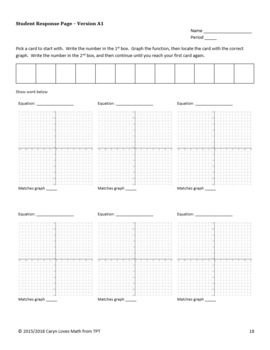 This activity is designed to help students with graphing the cubic functions by shifting/reflecting/ and dilating the parent graph. This activity also gets students up and about. Place the 12 cards on the wall around your room. 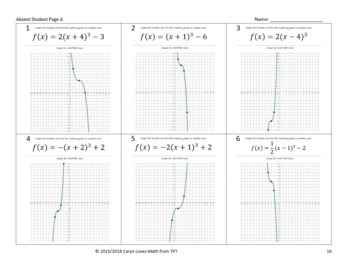 Students pick any card to begin with, then graph the function on the bottom of the page. After graphing on their own paper, students look around the room for a graph that matches theirs. 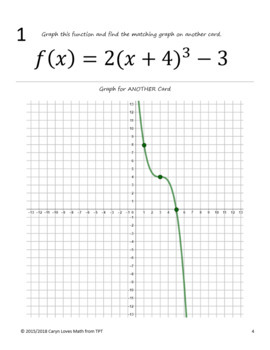 Then they graph the next problem. They should continue until they return to the card they started with. until they return to the card they started with. Included are 2 versions of this activity. * One with 12 cards for use as a walk-around activity. 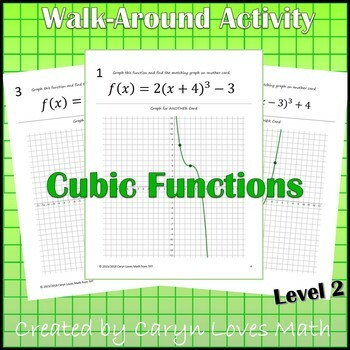 * A shorter version with only 6 cards great for table work, bell work or use as a review. * Plus an absent student page with all the graphs printed on just 2 pages so they can complete at home.